These amazing scallion (green onion) pancakes are served up hot and fresh in stacks from local street vendors around the world. They're most commonly found anywhere there's a large Chinese population, including in China, Malaysia, and Taiwan. Various Chinese restaurants serve them as well. Though they're called pancakes, these green onion pancakes are more than just a breakfast food, so enjoy them anytime. Serve plain or dipped in a good quality soy sauce (like a Japanese style Tamari, which would be excellent with these Taiwanese-style scallion pancakes!). When you look at the recipe, it does seem very simple, but this is one of those recipes that somehow when you put it all together, it seems to add up to so much more than just the sum of its parts. It's a logical fallacy food! 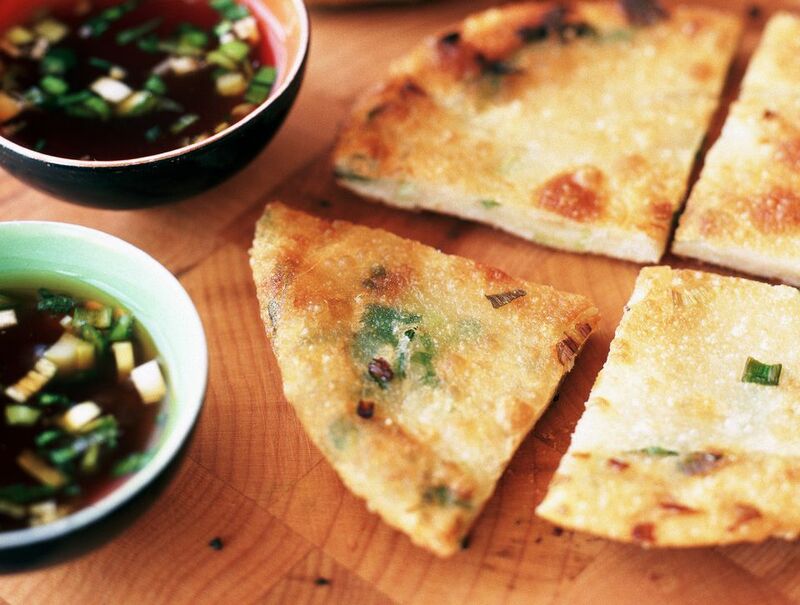 This recipe for Chinese Scallion (Green Onion) Pancakes is both vegetarian and vegan. Mix the flour and water until a dough is formed. On a lightly floured surface, knead the dough for a few minutes. Place in a bowl, cover and set aside for 30 minutes. Roll out the dough to a 1/8 inch thickness. Brush a thin layer of oil or vegan margarine on the top, sprinkle with salt, and then press a layer of green onions into the dough. Now here's the secret to making scallion pancakes: Once you have a flat layer of dough with the green onions on top, roll it all up into a cigar-like shape. Then, roll out the dough again onto a floured surface to about 1/8 inch thickness, pushing any green onions that escape back into the dough. This is the critical step that is going to give the pancakes their perfect texture and flakiness. You may need to make two or three large pancakes, but try to make as few as possible. You'll slice them up to serve them, rather than make individual pancakes like you would with American breakfast pancakes. Fry your scallion pancake in 1/4 inch of vegetable oil in a skillet over medium heat. Cook each scallion pancake for approximately 3 minutes on one side then flip and cook for 2 more minutes before placing the pancakes onto a paper towel-lined plate. Salt to taste and serve immediately with soy sauce for dipping. Yum!